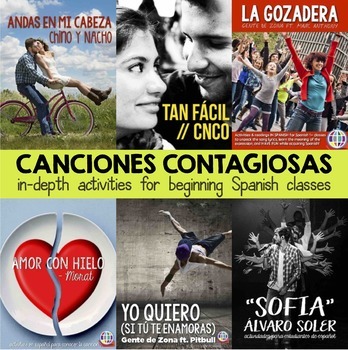 This bundle of six songs for Spanish class is a must-have! It includes lesson plans and activities for six songs that students (and their overly enthusiastic Spanish teachers) LOVE. All of the lesson plans provide multiple opportunities for students to interact with and explore the meaning of the song lyrics through lots of comprehensible input and several targeted listening activities. Each lesson plan includes easy to understand readings in Spanish about the content of the song, fictitious backstories, and/or artist biographies. Get more Canciones contagiosas here!